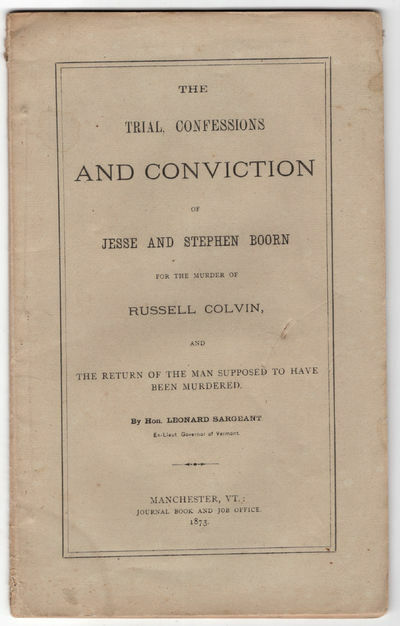 The trial, confessions and conviction of Jesse and Stephen Boorn for the murder of Russell Colvin, and the return of the man supposed to have been murdered. Manchester, VT: Journal Book & Job Office, 1873. 8vo (23.3 cm, 9.25"). 48 pp. The trial of the Boorns "is one of the most famous cases of American criminal law and a constant reminder that innocent persons can be convicted. Russell Colvin, the alleged victim, had married a sister of the Boorns and had several children by her. He was mentally deficient and disappeared in 1812. Local gossip credited the Boorns with having disposed of him, presumably because he was a burden on the family. In the spring of 1819. the Boorns were arrested and, either from fear or mental weakness, they told stories involving each each other in the death of Colvin - Stephen's amounting to a confession of murder. They were tried and sentenced to be hanged; the state legislature, however, commuted Jesse's sentence to life imprisonment. As a last resort a notice was placed in the papers requesting information about Colvin. A farmer in Monmouth County, New Jersey, believed he recognized a hired man in the vicinity from the description. This man, who was mentally deranged, was enticed to Manchester, arriving on December 22, 1819, six weeks before the day set for Stephen's execution. It was definitively established that he was the missing Colvin; he had apparently wandered off of his own volition" (McDade). Sargeant (1793-1880), one of the Boorns' defense attorneys, offers this account as a cautionary tale of the fallibility of the legal system. "Thought published fifty-four years after the event, the pamphlet . . . contains important information on the discover and return of Colvin" (McDade 113).